Elopement and wandering … running away, bolting, whatever you want to call it can at best be a worrisome and stressful event, at worst a parent’s nightmare come true. K had elopement issues at an early age. She would refuse to hold hands outside and try to run away to some place unknown to us adults. Inside she would open windows, doors, the sliding door and run out. In the apartment, we used the hotel sliding lock on the front door, special window locks, and another lock on the sliding door. She was catchable during those moments when she was 2 to 5 years old. Even she was fast! The biggest scare, I had was back in 2011. K and I had moved back to our home state. K was 6 at the time, we had spent the night at a friend’s house like we have done many times before. In the middle of the night, K got up and got out the house. She undid all the locks on the door and got out! We all woke up shortly after and noticd K was gone from the condo! Molly, Josh and I ran outside to start looking for her. Behind Molly’s condo is a steep hill going into the woods with a stream somewhere at the bottom. Around the condo there was a broken basement window. We started to yell out K’s name but go no respone. Understand, that at 6 years old, K could only say a few words, not answer questions, would not say her name, repeat certian scripted lines from songs in her sing songy voice. She had no sense of danger and no understanding of what to do in a situation like this. Then I heard sirens! My heart fell into my stomach and I, on instinct, ran towards the sound. Probaly about 1/4 mile down the road, I saw K sitting on the hood of some lady’s car!!! Thank the heavens above and the angels watching over K that day! Some kind lady saw her walking down the road and stopped. This lady, who I never found out her name, called the cops. The cops were there. I explained to the officers that K has Autism. That we stayed over at a friend’s house and this happened. They took my information but nothing ever came of it. No one showed up at my door from any agency, charges were never pressed or anything of that nature. 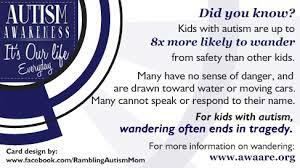 Now I did set in montion certian changes to prevent this from happening. Any house that K visited alot like Molly’s, her Grandfather’s, or where we lived door alarms were installed at all the houses. My house and my father’s there were window locks install, double key dead bolt locks, and the door alarms. 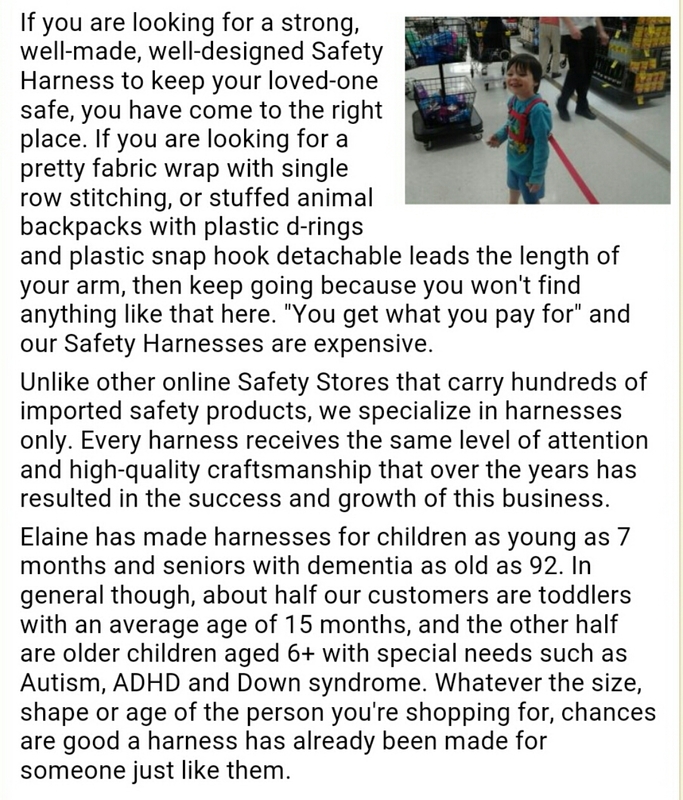 I even want has far as to buy a harness from Custom made harnesses by Elaine. During the day, the harness was used when we went out to prevent K from bolting into any given direction. At night, I used the harness to prevent another night time escape. K would wear the harness and she would be tethered to my waist at a very short length. And this is how we slept – especially when we went to Molly’s or on the family vacation to the mountains where the area was surround by a lake. This kept K safe both during the day and at night. 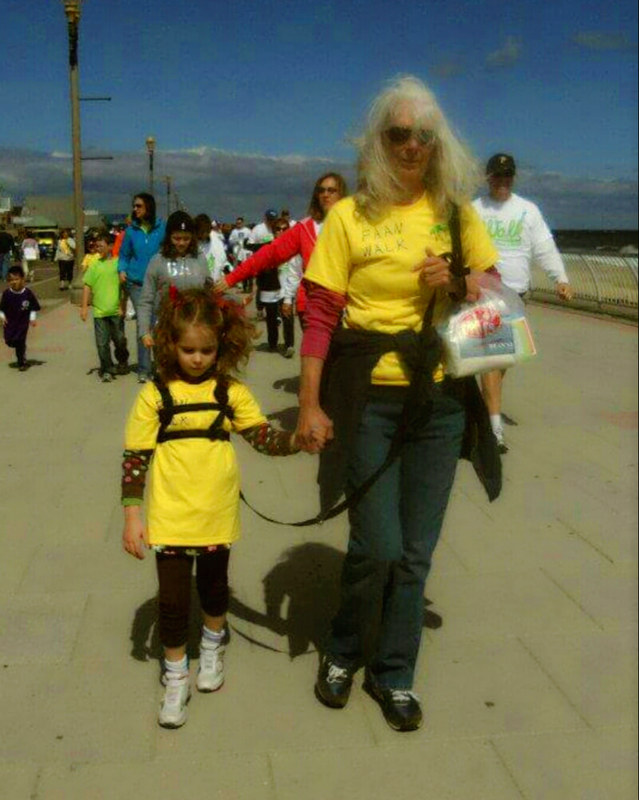 The above picture is of her at a charity walk that we did down by the shore wearing the hearness. I did look into the gps bracelet for her, however it turned out to be to costly. The county I lived in did have a program, but the cost per month and having to go there once a month to change the battery did not work with my work schedule. They were only open Monday – Friday and closed at 4pm. Now at age 11, the elopement factor is not done as often and K can go long periods without having an episode. But it is still there lingering in hind sight. She has done it over the years and has done it in school. She has run out of the classroom, tried to get out of a moving vehicle (yay for child safety locks! ), run back to a store, run away from a therapist or myself with that weird, giggly smile she gets when she wants to get into trouble on purpose – this she has done sporadically over the last few years. 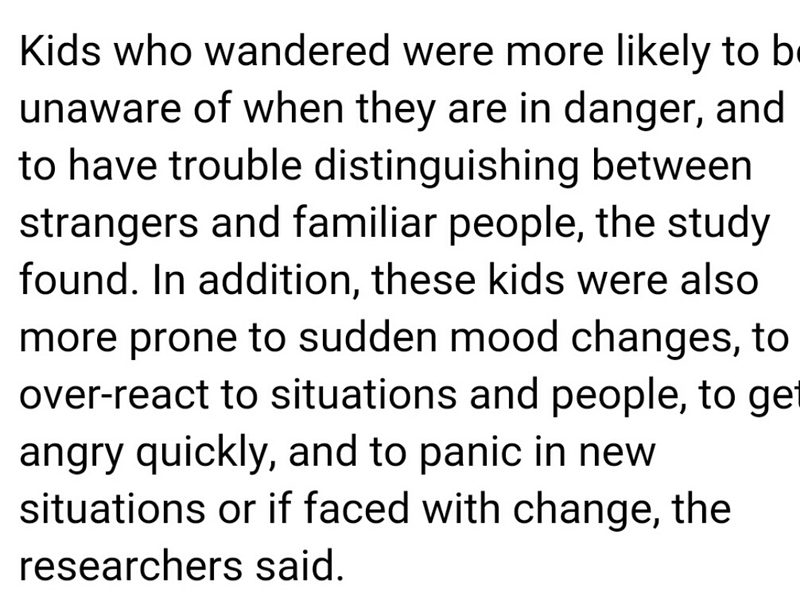 So all one can do is be mindful that IT can happen and not to get too relaxed about it. Below are some links providing information about stories of kids eloping both with happy and fatal endings. 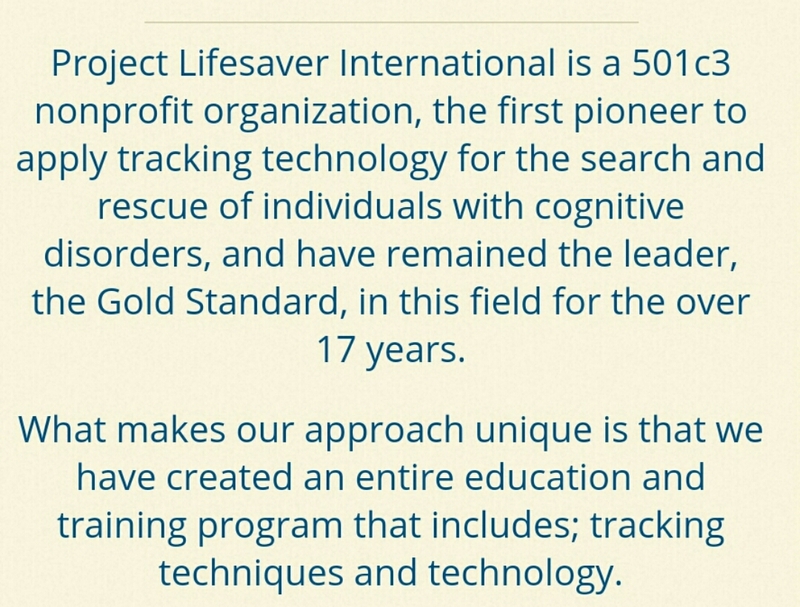 There is also resouce information to help parents and links for Project Livesaver and Custom Harnesses by Elaine. The link for below picture is not attached. 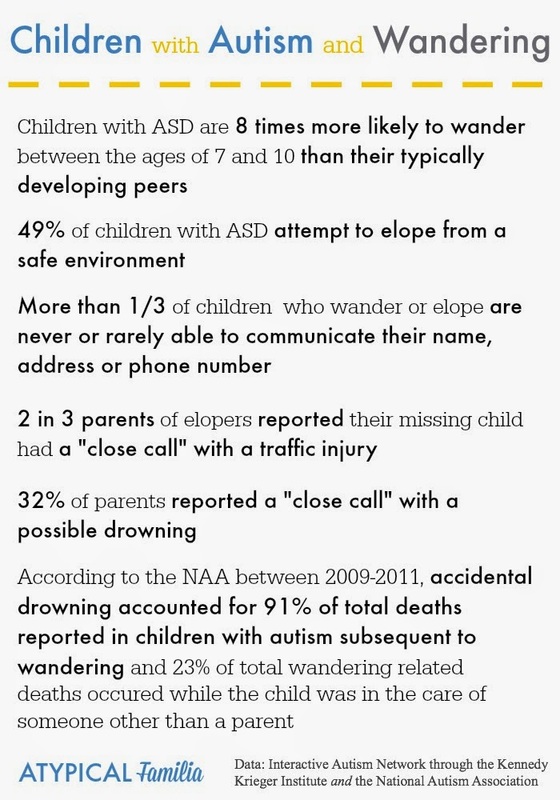 This is a PDF from the National Center for Missing and Exploited Children which needs to be downloaded inorder to view. 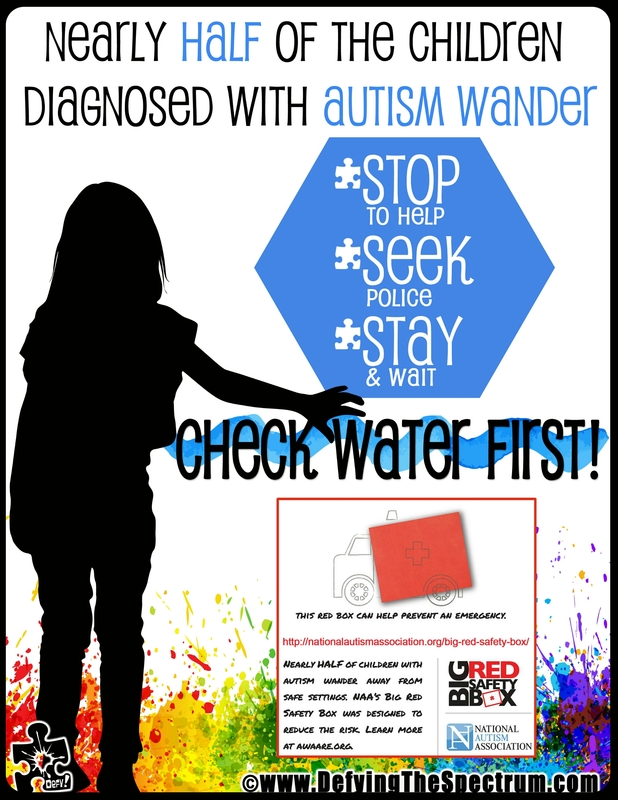 Google the “Missing Childern with Special Needs by National Center for Missing and Exploited Children”to read the helpful information.